I'm finally buckling down and starting to weave the table linens for my son's wedding in September. I really had to force myself to do this, not because I don't want to make them, but because I seem to have serious weaving burnout since all the holiday weaving. 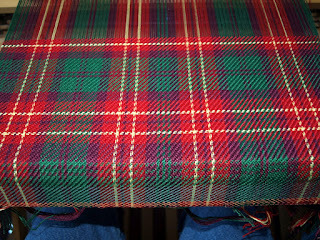 That, and these will be woven as plaid, and that means lots and lots of color changes, which really slows down the process. However, I do really like the way the cloth is turning out. I just finished the first placemat this morning, and so have 9 more to go, plus the table runner for the cake table. The bride picked out the colors, and I think she did a wonderful job. They reflect apple colors, plus the dark red/maroon will hopefully be close to what is being piped onto the cake. I know that September will be here before I know it, and I want to make sure these are all set well ahead of time. 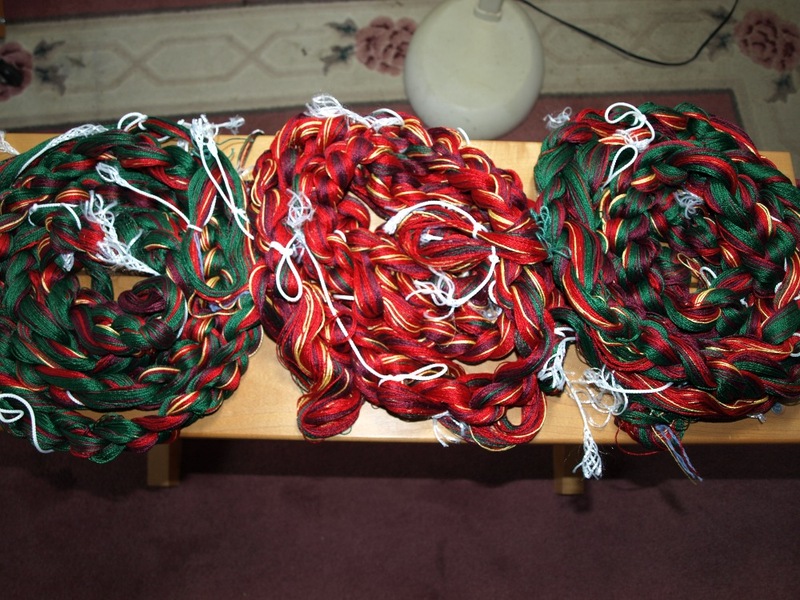 Here you can see the three warp chains, all measured and tied, ready to be put on the loom. They are 12 yards long each. Dressing the loom turned out to be a horrible process. 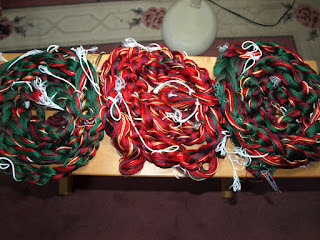 All the threads (316 of them) got very tangled despite being tied at 2 yard intervals. This seems to be an ongoing issue with me if I have anything over 4-5 yard warps. Usually I tie them at 1 yard intervals, but I stupidly felt that since the yarn had a slightly thicker grist than I usually use (5/2, for you weavers out there), that any tangles would be easily taken care of. Man, was I wrong. And, no, I didn't take a photo of the resulting bird's nest - it was just too depressing. After the tangles were dispatched, which took the better part of the afternoon, the threading of the heddles and the sleying of the reed went very smoothly. This morning I started the actual weaving, and I love how they are coming out. I'm weaving hems in 20/2 cotton, which is by far the finest yarn I've ever used - it makes me very grateful that I'm not weaving the entire warp with such a thin yarn! 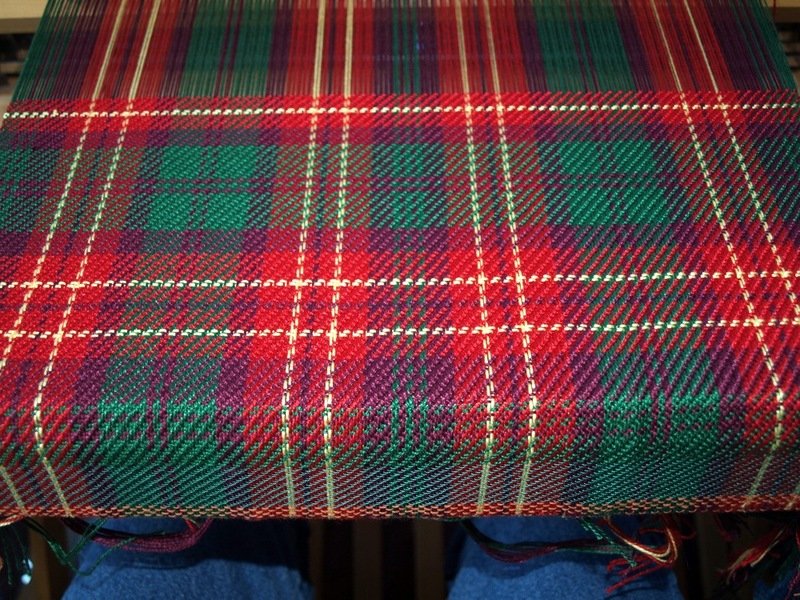 The plaid is a pattern that I got off Handweaving.net, which I then played with and switched a bit to my liking. There are alot of frequent color changes, which means cutting, starting and stopping... All of that will make for slow weaving, but I know the final outcome will be worth it. I'm hoping that the bride will approve! There is a couple of errors, er, design elements that I can see, but I think they will still be acceptable. 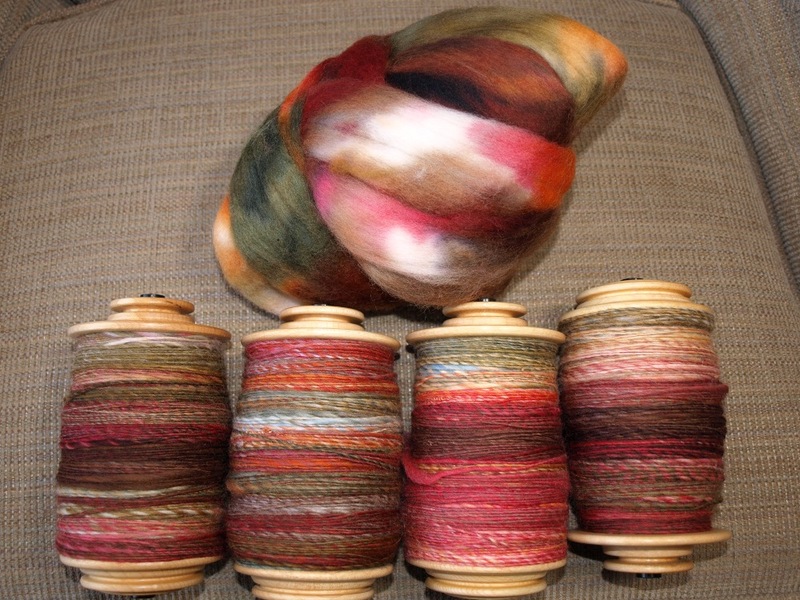 On the spinning front, I've been trying out another new skill, this time on my wheel. 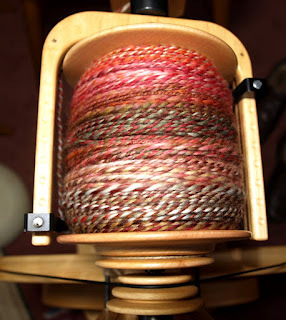 I took 24 ounces of hand-dyed wool from a supplier in western Maine and spun it up long draw, a new technique. It certainly made the spinning go alot faster, and the yarn is very lofty, albeit a bit thicker than I wanted. This makes a woolen yarn, as opposed to a worsted one. 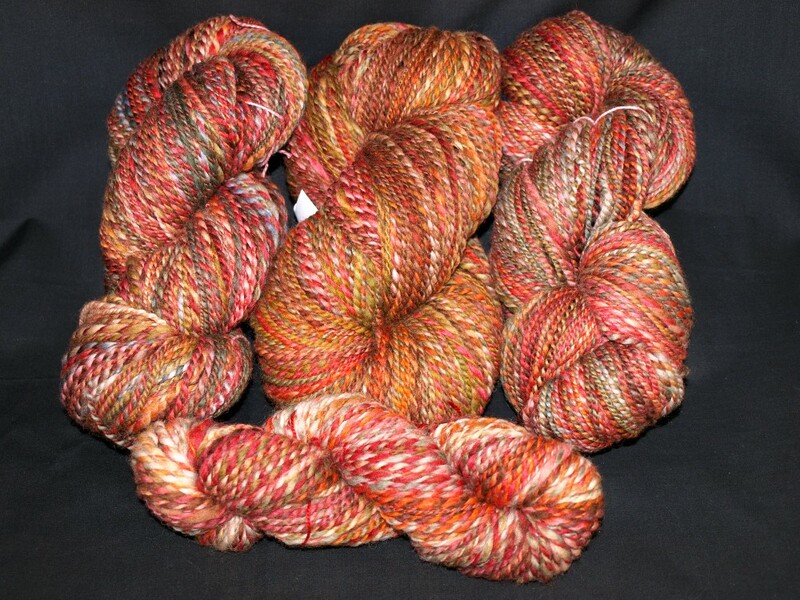 These colors are supposed to reflect the changing colors of autumn in New England, and I think the dyer did a masterful job, as always. and ended up with ~830 yards, which I hope is enough for a sweater of some sort. It will be knit with bigger needles than I usually use, so I will definitely have to sample. As you can see from this next photo, 2 of the 4 ounces came from a different dye lot, so I will have to try to work it in so that it is not quite as noticeable. I really wish that you could feel it - it is SO soft! I'm also still working on the spindle spun, ply-on-the-fly yarn from my other post. I'm about 1/3 of the way through the second half. 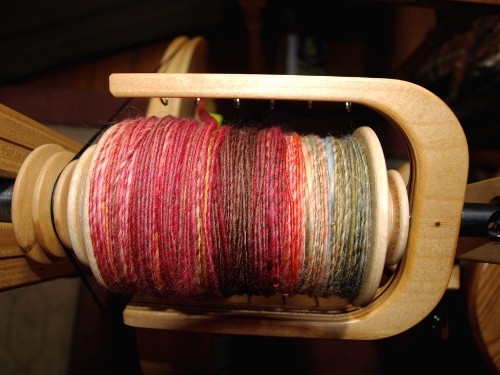 I spin that in my odd spare moments, so it will take awhile, too, but it's so nice to have something I can quickly pick and put down without too much thought. Back to weaving I go!